Mayo is a wondrous place ~ nature’s melting pot of bog, dramatic coastline, forests, mountains, lakes, rivers and plains, teaming with wildlife and plant growth. Mayo’s unique and ever-changing light ensures a different display of beautiful colours every few seconds. It’s people are unique also, proud and appreciative of a pace of living that embraces the finer things in life – good food, music and song. By Train: The towns of Claremorris, Castlebar, Ballina and Westport are served by a direct train link from Dublin. 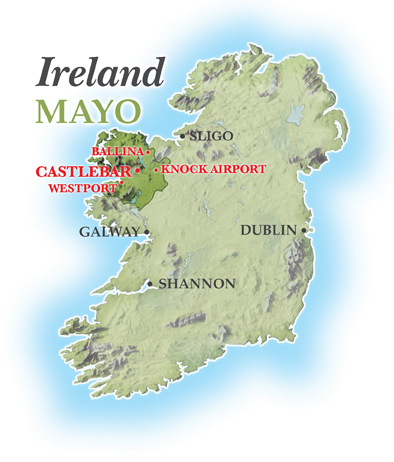 By Air: Ireland West International Airport (Knock) has direct connections to Dublin and London and is within 20mins of Claremorris, and 40 mins of Castlebar.